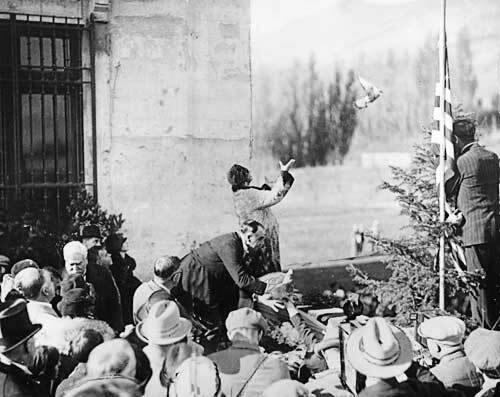 Queen Marie of Romania dedicating the still unfinished Maryhill Museum in 1926. Eventually the world seems to show up on the doorstep of the Maryhill Museum of Art. 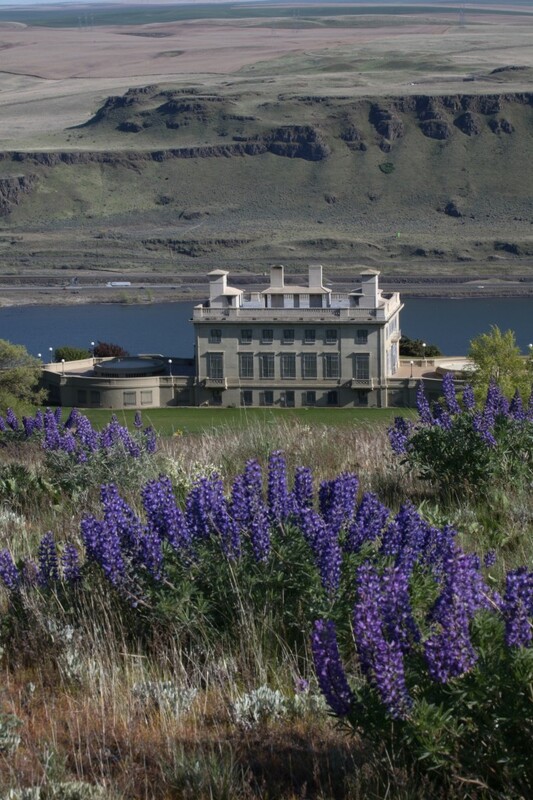 Which is a funny place for the world to show up, in this isolated concrete mansion overlooking the Columbia River Gorge in the semi-desert landscape of Klickitat County, Washington. But look at the evidence. Marie, the bohemian queen of Romania, and Loie Fuller, the American dancer who was the toast of European arts circles around the turn of the twentieth century, were vital figures in the founding of the museum. One of the museum’s signature collections is the ornate scenes of Theatre de la Mode, the post-World War II tableaux of design that helped get the French high-fashion industry back in gear and that features fantasies by, among others, the incomparable Jean Cocteau. Another important collection is the museum’s icon paintings, many from eastern Europe and Russia. It’s a long story, and worth hearing, but not right now. Partly because of weather and isolation, Maryhill is a seasonal museum, and it takes its annual break Nov. 15 before starting up again in spring, on the ides of March. That gives you a couple of weeks to make the drive out the Gorge: It’s a little more than 100 miles east of Portland, about the same distance as Eugene, but a much more interesting drive. When Lee Musgrave arrived as curator of art from Los Angeles 14 years ago he brought a vision for contemporary art to amplify and complement the museum’s historic collections, which ranged from outright curios to engaging oddities such as a collection of global chess sets to some very good Rodins. Works by the likes of Red Grooms, Andy Warhol and Jeff Koons started popping up on the museum walls, plus pieces by a whole lot of contemporary Pacific Northwest artists. Musgrave retired this summer, and his replacement, Steven L. Grafe, is just getting his feet dry. I’d say “wet,” except it doesn’t rain much at the Maryhill end of the Gorge, and Grafe already knows a lot of the territory. Grafe arrives at Maryhill after almost six years at the National Cowboy & Western Heritage Museum in Oklahoma City, where he was curator of American Indian art. It was a good stop for a specialist in Native American art and culture. But Maryhill is very close to home. Grafe earned his masters and doctoral degrees in art history from the University of New Mexico, where his doctoral dissertation was on pre-1880 beadwork from the southern Columbia River Plateau — an area of deep interest, not coincidentally, in the Maryhill collection. And he put in a couple of years as chief curator of the Southwest Museum of the American Indian in Los Angeles, in addition to curatorial stops at Mesa Verde National Park in Colorado and Cape Hatteras National Seashore in North Carolina. He grew up in Salem, got his bachelor’s degree in studio art at Oregon State University, and has deep Northwest roots. His father’s family is from the Santiam area east of Salem, his mother’s family is from around Zigzag near Mt. Hood, and his wife went to Madison High School in Portland. “She’s wanted to live at the east end of the Gorge since she was in high school,” Grafe said a couple of weeks ago when he was in town for a museum marketing meeting.